With 3 Step IT’s future proof integration opportunities you can focus on your core business and create a scalable base for your growth. The 3ConnectIT API family gives you the opportunity to integrate asset information with your systems to automate IT administration processes. The rules define the communication language, data format and data content that can be transferred. Any system that meets the API definitions can communicate with AssetNG. 3 Step IT offers the API. The other party uses API to communicate with 3 Step IT AssetNG. The API allows end-user support to use asset data base information. This automates inventory searches so the support team can provide a more responsive service, and resolve problems faster. 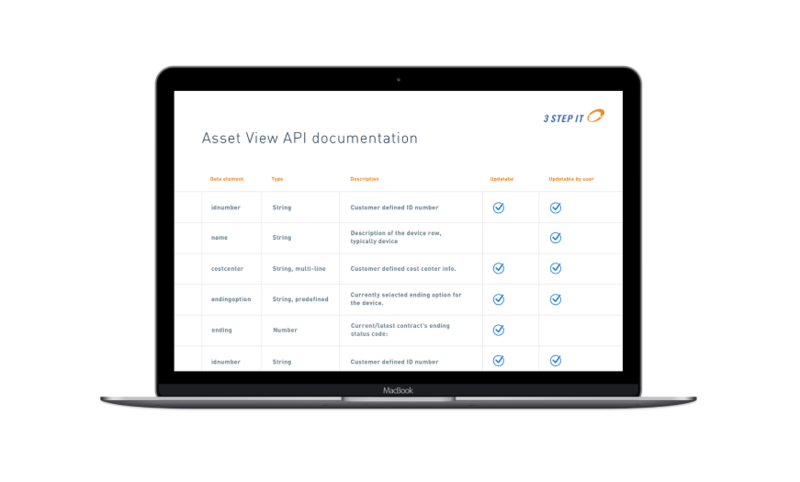 The API allows logistics systems to work smoothly with the asset database, so it’s easy to advise users when the device will be delivered or an old one collected. Automated, integrated systems handle growth smoothly. There is no IT administration burden handling extra devices and new users. COMPANY TO THE DIGITAL FUTURE? from our integration API. Type in your email and we’ll be in touch.